Zürich is the largest city in Switzerland and is considered the cultural and commercial centre of the country. Set up as a tax collecting town during the 1st century AD of the Roman Empire. The city slowly grew into a major center and in 1351 it joined the Swiss Confederation, although it was expelled from the federation from 1440 to 1451. The city kept growing and was spared most of the savages of both World Wars because of Swiss neutrality. Today the city is home to great churches, museums and stunning culture. There are several city wide festivals that are worth checking out. From 2006 to 2008 this global city was named one of the best cities to live because of a great quality of life. Altstadt is the 1st district and is around the old town, which crosses both side of the Limmat River. District 2 is on the west side of Lake Zürich. 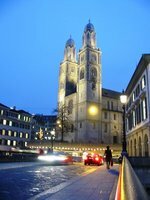 The Grossmünster is an amazing Romanesque-style church and was extremely important place during the Protestant Reformation. The church was built in its present from in 1220 to add to the cities impressive architecture. In 1520 Huldrych Zwingli started the Swiss-German Reformation at this church and set the president for many changes for the church, such as the abandonment of lent, replacement of the Mass, disavowal of celibacy, eating meat on fast days and a band on church music. The Fraumünster Abbey was originally built in 853 with several additions added later. The distinctive tall bell tower and the 5 Marc Chagall windows cannot be missed. St. Peters is a wonderful church that is home to the world's largest church clock face in the world. Museum Barengasse is a museum dedicated to the 17th history legacy of the city. Kunsthaus Zürich is one of the best art museums in Europe and has a great collection ranging from the Middle Ages to Contemporary Art. Museum Rietberg is an art museum dedicated to the arts of Asia, Africa, America and Oceania. Museum Bellerive is dedicated to fasion, architecture and design. The musuem is located on a villa on the beach of Lake Zurich. Migros Museum is dedicated to modern and avant-garde international art. Swiss National Museum is a history and art musuem. Johann Jacobs Museum is a history museum dedicated to fine colonial food and coffee. NOMAN is the North American Native Museum and will reopen February 8th, 2009. Uhrenmuseum Beyer is dedicated to the history of timekeeping and timekeepers. Lindenhof is the site of a Roman and medieval castle. The Guild Houses are located along the river downstream of the Grossmunster. Bahnofstrasse is the main shopping street in Zurich. Parade-Platz is a stunning plaza and the centre for financial activity in the country. Lake Zurich is a wonderful lake and great green space. Zurich Opera House is a wonderful opera house and one of the most famous in the world. The Zürich Street Parade is one of the largest street parades in the world and a popular attraction for techno music fans. Sechseläuten is a large festival sponsored by the guild houses. The festival is held every year in April and features the burning of the Böögg. Zürcher Theater Spektakel is an international theater festival. Kunst Zürich is an international contemporary art fair. The warmest months are June to August with most of the rain happening during these months. Temperatures are between 23 °C and 25 °C. The coldest months are from November to March, between 2 °C and 5 °C during the day, -3 °C at night. Zurich is wetter than many other parts of the country, with especially much rain in summer. Some snow is possible in winter. Zürich Airport (IATA: ZHR, ICAO: LASZH) is also known as Kloten Airport and is located 10 kilometres from the city. It is Switzerland's largest airport and hub for Swiss International Air Lines. It is possible to fly to every major and minor airport in Europe and most international destinations from here. There is a train station located under the airport making for quick and easy connections to the city. Zürich Airport railway station is located underneath the terminal. There are trains to many parts of Switzerland. There are frequent S-Bahn Zürich services on the lines S2, S3 and S16 and of the Glatttalbahn (Zürich tram line 10). Also, there are direct InterRegio and InterCity services to Winterthur, Bern, Basel, Brig, Sankt Gallen, Lucerne and Konstanz in Germany. It also has EuroCity services to Munich in Germany. By changing trains at Zürich Hauptbahnhof most other places in Switzerland can be reached in a few hours. The Swiss Federal Railways (SBB-CFF-FFS) website has more details about schedules and prices. Regular trains to and from other Swiss and European cities leave from and arrive at Hauptbahnhof, the main train station, located in the city centre at the end of Bahnhofstrasse, with easy access to mass transit. The Zurich Hauptbahnhof (HB) is served by the local S-Bahn commuter trains, InterCity (IC and ICN) connections throughout Switzerland, Italy, Germany's IC and ICE, France's TGV Lyria and Austria's Railjet with some direct connections reaching destinations as far in Eastern Europe as Budapest. While Switzerland itself does not have many high speed lines, Zurich is connected to the high speed rail networks of neighboring countries. The once extensive sleeper train network has been cut down a lot in the 21st century, but there are still some ÖBB Nightjets connecting Austria and Germany with Zurich. Domestic train tickets within Switzerland are available through the SBB Website though there are few early bird discounts. International tickets can sometimes be bought through the SBB as well, but often you can get better offers through the DB website (German) the SNCF website (France) or the websites of ÖBB and Trenitalia for Austria and Italy respectively. All adjacent railroads have (sometimes significant) discounts for early booking on international trains, so if you know your plans far in advance, by all means book early. The train station and the connecting underground mall has shops, restaurants, and a grocery store which locals use when they need to do Sunday shopping, as it is not subject to the closing hours laws otherwise in force in the city. It also hosts a Christmas market and other events in the big entrance hall. There are some 24-hour lockers in level B1 available for Fr. 6-9 per 24hr (maximum 3 days). Just to the east of the train station on the Bahnhofbrücke bridge, there is a large Coop supermarket open Monday to Saturday till 22:00. Almost every highway in Switzerland leads straight into Zurich. This might be quite convenient for tourists who drive, but is also really painful if you have to cross Zurich on a daily basis. The bus station is next to the main train station, near the confluence of the Sihl and Limmat. Many buses arrive from other European cities, mainly southern destinations such as the Western Balkans or Spain. There is a bi-weekly bus to Banja Luka, Bosnia and Herzegovina (look for "Cirih"). Zurich is also served by a number of German operators. As Zurich is located at the end of lake Zurich, it can be reached by boat from other lake villages, e.g. Rapperswil at the upper end of the lake. Driving in Zurich is possible but it is painful as the city centre is not easy to navigate by car. The taxis in Zürich are very expensive compared to New York, London and other major cities. Most of the taxi-drivers are unfriendly and uncommunicative. Better travel by tram, bus or S-bahn. Zürich is famous for its highly efficient, clean and safe public transport system, owned and managed by the http://www.zvv.ch/zvv/en/home.html|Zürcher Verkehrsverbund (ZVV)]] which covers the entire canton of Zürich as well as Rapperswil-Jona in the canton of St. Gallen and Pfäffikon SZ in the canton of Schwyz. The network includes trams, buses, S-Bahn (suburban trains), cable cars and boats. The size and complexity of the network may be daunting at first, but you will soon realize that there are dozens of ways to get from one place to another and following any of them will still be efficient. The system is divided into numerous fare zones, with the city centre and innermost suburbs being in zone 110 and the outer suburbs located in other zones (Winterthur is in zone 120, for example), and the more zones you pass through, the more you'll have to pay for your journey. There are single tickets, day cards, monthly cards and annual cards. The monthly and annual cards are collectively referred to as ZVV NetzPass. Tickets must be purchased from a ticket vending machine before boarding or from one of the ticket selling kiosks. The ticket vending machines are in German, English, French and Italian and offer almost all regular tickets available (not personal tickets though). You select the zones you wish to pass through upon buying the ticket, with a zone map on every machine as well as clear instructions coming to your aid, so feel free to choose! Once you've got your ticket it gives you access to all modes of transport. If you're staying for a longer period, consider a monthly ZVV NetzPass, because even though there are no regular tickets valid for something between 1 day and a month, it takes only 10 "zone 110" day cards for a "zone 110" monthly card to be cheaper. When travelling in all zones, it takes only 8 day cards for the monthly card to be cheaper. A 24-hour ticket for zone 110 costs just the same as two single rides. If you don't mind starting your travels after 09:00, the "ZVV-9-UhrPass" is the best option. It is available as both daily, monthly and annual cards and will save you a lot of money compared to regular similarities, especially given that the 09:00 rule does not apply on weekends. Several tram lines, trolleybuses and buses cover the city at street level. Like all other public transport in Zurich, you must purchase and validate tickets before boarding, or risk a fine if they decide to spot check. You can find a timetable at every stop which is usually accurate to the minute, however delays do occur due to heavy traffic, rerouting, or other factors. The 'S-Bahn' is Zürich's convenient and fast suburban rail system which covers nearly all suburbs of Zürich and beyond. Zürich's S-Bahn system provides convenient and fast service throughout the region. All lines except the rural ones pass through the Hauptbahnhof. The ZVV offers directions for a series of excursions on the S-Bahn. You must have a validated ticket before you board. If you do not have a ticket you will be liable for an on-the-spot fine of Fr. 80. There are two types of boat-based public transport operated in Zürich: river buses and lake steamers. The river boats operate in the summer months only and the lake boats operate on a much reduced schedule during the winter. The river buses operate between the Landesmuseum (near the Hauptbahnhof) along the Limmat River and out in the Zürichsee (Zürich Lake) to Tiefenbrunnen. There are several stops along the Limmat River. The Zürichsee Schifffahrtsgesellschaft (ZSG) operates lake steamers which leave from Burkliplatz (at the end of Bahnhofstrasse). The ZSG's website provides information on destinations and ships. The ZSG offers a variety of tourist-oriented trips (including Jazz Brunch, and historic restored steam ships), and a popular trip is to Rapperswil at the south end of the Zürichsee. The town has a beautiful castle overlooking the lake surrounded by a medieval town. The main train station, old town and the lake promenade and all nearby tourist attractions are easily walkable. You may find that you don't need transport for most of your tourist needs once you get into the city. You can "rent" bikes, skateboards, etc., for free from 07:00–21:20 daily May-Oct at several places in Zurich and year-round at the central train station. All you need is your passport and a Fr. 20 deposit as guarantee. This offer is called "Züri rollt" (German only). You can get and return the bikes at several locations: the bikegate just next to the central station, next to the "Globus City" shopping centre, next to the opera, or at the Swissotel in Oerlikon. If you can't find these places, don't hesitate to ask some locals, they should know at least the bikegate at the central station. The Zurich Transit Company, VBZ also provides information about these bikes in English. Nevertheless, you shouldn't count on it because sometimes the "rent" spots run out of bikes. The quintessential Zürich dish is Zürcher Geschnetzeltes (Swiss-German: Zürigschnätzlets), sliced veal in a cream and wine sauce. Various kinds of grilled wurst (sausages) are also popular. These are most often accompanied by boiled potatoes, rösti, a Swiss potato pancake (grated potato, formed into a pancake then pan fried until crisp in butter or oil similar to hash browns) or chnöpfli, in German sometimes called Spätzle (small noodle dumplings). Veal is still very popular, though the use of turkey and other meats as a substitute is growing. While fondue (melted cheese in a central pot, dip bread into it) and Raclette (cheese melted in small portions, served with potatoes and pickles) are not really local to Zürich (they come from the Western Switzerland) they are commonly available at restaurants aimed at tourists. Swiss people usually eat those dishes at home and only during winter. The bread available in Zürich is generally delicious. There are many varieties, and your best bet is to go to a bakery or a supermarket in the morning or just after work hours, when most people are doing their shopping and bread is coming out fresh. Try grilled bratwurst from street stands, served with a large crusty roll of sourdough bread and mustard, or sandwiches made with fresh baked bretzeln (large, soft pretzels). A typically Swiss bread is the zopf, a braided soft bread that is commonly served on Sundays (the other name for it is Sonntagszopf). For breakfast, try a bowl of müesli, which was invented as a health food in Switzerland. The Sprüngli confectionery store tea rooms serve a deluxe version of this fiber-filled cereal with whole milk, crushed berries and cream. There are a huge variety of cheeses available at the supermarkets, specialty stores and markets, as well as all kinds of hams and dried sausages. Dairy products are generally delicious, especially the butter. Do not miss the supermarkets! You should take a thorough look through Migros or Coop and maybe even assemble your own lunch or dinner some time. Even the cheap, budget prepackaged desserts in the supermarket exceed the quality of what you may be used to. For those with a sweet tooth, there's a huge variety of chocolates to enjoy, from the cheapest chocolate bar to individually handmade truffles. (See the Shopping section above). The chocolate bar displays at the supermarkets will overwhelm you! Also enjoy pastries and cakes from the various Konditorei scattered around town. In pastry shops, you can also find special pastry from Zurich: The most famous of them probably is Tirggel, a rather hard pastry made of flour and honey. Although traditionally made and eaten during the Winter holidays, many pastry shops (including larger supermarkets) sell them throughout the year. Often, they've got sights of Zurich printed on the top, can be stored for months and thus make up a pretty good and cheap souvenir. Another famous type of pastry are Luxemburgerli exclusively sold by the confectionery chain of Sprüngli (part of the famous chocolatier Lindt & Sprüngli). A typical cake is the Mandelfisch, an almond cake shaped like a fish. Like most European cities, Zürich abounds with cafés where you can enjoy a leisurely cup of coffee, glass of wine or other beverage, and watch the world go by. There are many international dining options available too. The current hot trend seems to be pan-Asian noodle, rice, and sushi places. However, due to the far distance to the sea and the lack of original, well-trained Chinese/Japanese cooks, the quality cannot live up to that of the original countries. Instead, the Italian cuisine holds the highest popularity among the foreign restaurants. They can be found throughout the city and are relatively cheap. Turkish fast food restaurants are also a delicious, cheap option. Vegetarian food is easy to find throughout the city. Vegans may have a little trouble because cheese is used generously in most food, but should be fine living off supermarkets at the very least. Hiltl, the first vegetarian-only restaurant in Europe, is also worth a visit. You choose from the buffet, where your meal is priced by weight or from a variety of à la carte menus, which are a bit more pricey, but include vegetarian/vegan versions of popular Swiss meals like Züri-Gschnätzlets or Beef Stroganoff amongst Indian food and classic vegetarian plates. Another vegan friendly restaurant is "Bona Dea", which is located directly at Zurich Mainstation. The Migros and Coop supermarkets (several branches all over the city) are good places to assemble an inexpensive and delicious picnic lunch consisting of freshly baked bread, cheese or ham and fresh fruit. Migros Gourmessa is the 'gourmet' takeaway counter, available in larger Migros stores including the Migros City branch at Löwenstrasse. The Coop Bahnhofbrücke branch near the main station also has a small fast-food restaurant. The Migros branch in the main station is open on Sundays when most other stores are closed, and also until 21:00 on weekdays, whereas the Coop Bahnhofbrücke is open M-Sa 07:00 to 22:00. Jelmoli, St. Annahof and Manor department store restaurant for a cheap buffet lunch, good salad and vegetable stands. All located at Bahnhofstrasse and open during the day. Rosalys, Freieckgasse 7 (near Bellevue), ☎ +41 44 261 44 30. Typical Swiss food including Älplermacrone (pasta with apple purée). Excellent cocktail bar, too. Commercio, Mühlebachstrasse 2 (near Stadelhofen station), ☎ +41 44 250 59 30. Excellent pasta and a busy atmosphere. Commi-Halle, Stampfenbachstrasse 8 (near Central), ☎ +41 44 250 59 60. Italian food served late. Swiss Chuchi, Rosengasse 10 (in the Niederdorf), ☎ +41 44 266 96 66. A kitchy place serving up classic Swiss fare, mainly for tourists. Serves fondue year round. Zeughauskeller, Bahnhofstrasse 28a (near Paradeplatz), ☎ +41 44 211 26 90. 11:30–23:00. Offers hearty sausages, stews, rösti potato, etc., in a Brauhaus-like setting. Touristy, but good and large portions. Housed in a historical building, built in 1487. Zum Kropf, In Gassen 16 (just down the street from the Zeughauskeller), ☎ +41 44 221 18 05. Offers beer hall fare such as sausages and pork shanks in a somewhat refined setting. The restaurant features a beautiful painted ceiling. Globus Bellevue, Theaterstrasse 12. This relatively new branch of the Globus department store in the Bellevue near the Stadelhofen station is totally dedicated to food. There is a large eatery on the ground floor that serves various fusion-type foods (decent noodle bowl) and a passable sushi bar. The ground floor has a gourmet food market, and upstairs there are kitchen wares. Sprüngli Paradeplatz, Bahnhofstrasse 21 (1. Floor). The flagship store of the Sprüngli confectionery store chain has a beautiful turn-of-the-century style dining room upstairs that is extremely popular for breakfast, lunch and afternoon tea. Choose from the menu or from the gorgeous display case filled with beautiful cakes, tarts, open-face and regular sandwiches. Try the muesli! Great people watching too, since this is the place for an after-shopping snack for the rich ladies of Zurich. Masala, Stauffacherstrasse 27 (near Stauffacher), ☎ +41 44 240 03 61. Tasty Indian cuisine. Hiltl, Sihlstrasse 28 (behind Jelmoli department store), ☎ +41 44 227 70 00. The oldest vegetarian restaurant in Europe (from 1890). Tibits, Seefeldstrasse 2 (behind the Opera house), ☎ +41 44 260 32 22. The fast-food outlet of Hiltl, Europe's oldest vegetarian restaurant. Offers a nice self-service buffet of fresh veggies and fruit and a surprising variety. Try the freshly squeezed juices. Buffet: 3.60 Fr for 100g. Outback Lodge, Stadelhoferstasse 18 (at Bahnhof Stadelhofen), ☎ +41 44 252 15 75. Unrelated to the U.S. Outback Steakhouse chain. Enjoy Aussie tucker like ostrich, kangaroo, and crocodile, as well as more conventional fare. Popular with locals as well as expats. Has a hopping bar scene (see Drink section). There's also a branch in Winterthur. Iroquois, Seefeldstrasse 120, ☎ +41 44 383 70 77. Tex-Mex food in the trendiest part of town, with the best margaritas in Zurich. Tiffin's, Seefeldstrasse 61 (between Kreuzstrasse and Feldeggstrasse), ☎ +41 44 382 18 88. M-Sa. Great place for Asian food. Crowded. Lily's, Langstrasse 197 (between the railway and Limmatplatz), ☎ +41 44 440 18 85. Great Thai and other Asian food. The curries are particularly good and come in huge portions. Come before 19:00 or after 21:00 if you don't want to wait. Manzoni Bar, Schützengasse 15, ☎ +41 44 227 76 29. Morning till evening. Authentic Italian coffee and aperitif bar that offers clients over 20 different coffee specialties and a vast take away menu. The concept was created by the Manz brothers together with Francesco Illy, the most famous coffee brand in Italy. Nooba, Kreuzplatz 5, ☎ +41 43 243 60 06. Pan-Asian noodle bar, a short walk up the hill from Stadelhofen station. Stylish setting, attentive and multilingual service and a broad selection of freshly prepared noodle, rice and curry dishes. Nooch, Heinrichstrasse 267 (opposite the Cinemax movie multiplex), ☎ +41 43 366 85 35. Yet another Pan-Asian noodle, rice and curry joint. Also has a sushi bar. Ristoranto Toscano, Schmidgasse 3, ☎ +41 44 261 54 50. M-Sa. A very good Italian restaurant in the old part of the city (Niederdorf). You should try the Spaghetti al Bacio! Restaurant Eisenhof, Gasometerstrasse 20, ☎ +41 44 271 39 90. Has the warm feel of an old pub. The house specialty is horse steak, served on a hot stone with fries. Blinde Kuh, Mühlebachstrasse 148, ☎ +41 44 421 50 50. Restaurant in complete darkness, served by blind people. An amazing experience. Bebek, Badenerstrasse 171, ☎ +41 44 297 11 00. Breakfast until 16:00. Meze dishes and bar in the evening. White Elephant, Neumühlequai 42 (5 walking minutes from Zurich HB (Main Train Station)), ☎ +41 44 360 73 22, e-mail: info@whiteelephant.ch. Mon-Fri 12pm to 2pm, Sun-Thur 6pm to 10pm, Fri - Sat 6pm to 11pm. Original Thai Food. Since 1991 it offers an authentic cuisine with the full scope of original spices. eCHo Restaurant, Neumühlequai 42 (5 walking minutes from Zurich HB (Main Train Station)), ☎ +41 44 360 73 18, e-mail: info@echorestaurant.ch. daily 6 pm to 10.30 pm. Traditional Swiss cuisine. Everything is prepared according to original recipes, and all products originate from the region. Zurich has a lot of places to go out. There are a lot of clubs, restaurants, cafés, bars but also many museums and theaters. The most common drinks in Zurich include: Beer, Swiss white wine (e.g. Fendant), Swiss red wine (is delicious), and Spanish red wine (is generally good value here). At apéro time (after work), you will find many people drinking a Cüpli (glass of sparkling wine). For the best nightlife hit up the area of Niederdorf in the oldtown and Lanstrasse in the 4th and 5th district. Areas that are becoming more popular are Zürich West in the 5th district near the Escher-Wyss swuare and S-Bahn Station of Hardbrucke. Zurich has proportionally more clubs than any other city in Europe. You will find anything from very "fancy" clubs to places you can just chill. If you want, you can go to a club every night. There is always a Club that has a party going and Zurich's young make sure to splash all their income on going out. Most of the clubs are located around the Langstrasse and Hardbrücke. The internet site usgang.ch is a good place to look up what's up. Bar & Lounge 42, Neumühlequai 42 (5 walking minutes from Zurich HB (Main Train Station)), ☎ +41 44 360 73 24, e-mail: info@barandlounge42.ch. daily 9 am to 0.30 am. New York in the middle of Zurich. Exclusive whiskey rarities, unique cocktails, premium liquors, snacks, a homemade gin and an elegant smoker's lounge with a broad selection of cigars. Bierhalle Wolf, Limmatquai 132 (At the northern end of the old town, facing the river), ☎ +41 44 251 01 30, e-mail: info@bierhalle-wolf.ch. A lively beer hall often with live music. In addition to the beer selection, they serve great local food. Edi's Weinstube, Stüssihofstatt 14. nice wine bar in Niederdorf where you can get the cheapest okay wine in Zurich. Federal, Main Station (Tram 3,4,6,7,10,11,13,14, Bus 31, Main Station). A big brasserie-like bar inside the Main Station with a choice of 100 Swiss beers. Nachtflug, Stüssihofstatt 4 (Niederdorf). Stylish, coffee and some snacks during the day, large choice of drinks at night. James Joyce bar, Pelikanstrasse 8. Where the writer used to drink. Now mostly frequented by bankers. Oliver Twist, Rindermarkt 6, ☎ +41 44 252 47 10. An Irish/British pub with a good atmosphere, and many English-speaking foreigners. Has English ales on draught. Öpfelchammer (apple chamber), Rindermarkt 12, ☎ +41 44 251 23 36. Not a real pub or café, they only serve wine or water. But if you succeed in climbing over the roof beams, you get a free glass of wine to drink hanging upside down and you can mark your name into the wood afterwards. Widder Garage, Widdergasse 6, ☎ +41 44 224 25 26. By far the best stocked whiskey bar in town, with a separate whiskey menu containing 250 single malts. In the famous hotel of the same name. Corazón, Zähringerplatz 11, ☎ +41 44 261 09 59. A Spanish-themed bar with a good selection of wines and excellent service. Bohemia, Klosbachstrasse 2 (at Kreuzplatz, just up from Stadelhofen), ☎ +41 44 383 70 60, e-mail: bohemia@bohemia.ch. Trendy place popular for its coffee during the day and an even better nightlife. Usually a popular place for college students. Barfussbar, Stadthausquai 12 (a 3 minutes walk from Bürkliplatz along the Limmat river), ☎ +41 44 251 33 31, e-mail: info@barfussbar.ch. W Th Su 20:00–00:00, summer only. During the day this is a public bath for women only. But at night (after 20:00) men are also allowed. It is a beautiful place to spend a warm summer night with a great view of Zurich. Rimini, Badweg 10 (Go down Badweg from Talstrasse). 19:30–00:00, Sa 17:00–00:00, only in summer and only when it's not raining. Another open air bar. This one is at the men's public baths. Really cool atmosphere because of the nice colored lights and the straw mats and pillows. El Lokal, Gessnerallee 11 (on the Sihl). Bar, restaurant, and intimate gig venue attracting alternative crowd, "soccer vs elvis vs che guevara" themed. Zurich is the financial centre of Switzerland and most travellers come with an expense account. The hospitality sector focuses therefore mostly on the 4- and 5-star sector. Zurich is known for its superb hotels, but these won't come cheap. Best is to go on a company rate, because rack rates are sometimes ridiculous. Couchsurfing. Has a lot of members in Zurich. Public transport is very fast and good, so also consider staying in surrounding areas instead of in the city centre. Remember that couchsurfing is about the community and not only a free place to crash. City Backpacker/Hotel Biber, Niederdorfstrasse 5 (In the old town, a few minutes walk from the main station), ☎ +41 44 251 90 15, fax: +41 44 251 90 24, e-mail: sleep@city-backpacker.ch. The most convenient hostel for backpackers. There are shared bathroom and cooking areas. Dormitory Fr. 34. Private rooms available from Fr. 71. Hotel Krone Limmatquai, Limmatquai 88 (In the heart of the old-town), ☎ +41 44 251 42 22, e-mail: krone@reconline.ch. Check-in: 14:00, check-out: 11:00. A simple, small hostel. Some rooms have river view. from 34 Fr per person. Youth hostel, Mutschellenstrasse 114 (2 kilometre, 15 minute tram ride from the centre), ☎ +41 43 399 78 00, e-mail: zuerich@youthhostel.ch. A little way out of the centre, but the city is easily reached by public transport (take the S-Bahn to Wollishofen and walk over the hill). A clean and sleek facility, if a little quiet. From Fr. 42 for a dormitory bed with breakfast; Fr. 104 for a single room with shower. Hotel Marta, Zähringerstrasse 36, ☎ +41 44 251 45 50, fax: +41 44 251 45 40, e-mail: info@martahaus.ch. A "clean and friendly" place which doubles as a hostel and a one-star hotel. They also have weekly and monthly rates for rooms, and a couple of studio apartments. Otter, Oberdorfstrasse 7, ☎ +41 44 251 22 07, fax: +41 44 251 22 75. A good hotel for the price. The rooms have been decorated with the kind of care that one normally expects in a much more expensive hotel, each with its own theme. You can choose from the jungle room with its hammock, or the pink Carmen, or go for the top floor apartment. Each floor's three rooms share a bath, shower and toilet (WC), with the exception of the apartment which has its own shower. Fr. 115 for a single room, Fr. 150 for a double, and Fr. 200 for 2-person apartment (Fr. 240 for 4-person apartment). Hotel Splendid, Rosengasse 5. This hotel is relatively cheap. The rooms are clean but spare. Private showers and bathrooms are not available, you share with your floor. What is really great is the location, right close to the Gemüsebrücke and the city centre. Fr. 62-85 for a single, from Fr. 160 for a 4-person room, plus Fr. 2.50 City-Taxe per person. Etap Hotel, Technoparkstrasse 2 (Zurich West), ☎ +41 43 276 20 00, fax: +41 44 276 20 01. This hotel is in a great place if you want to party, next to some great bars and restaurants. The rooms are clean and comfortable. It's also near a tram station, which takes 10 minutes to get to the main train station. 90 Fr (low season) to Fr. 115 (high season) for a single room, and from Fr. 100 for double/triple occupancy. For Zurich, this is cheap. Hotel Schäfli, Badergasse 6, ☎ +41 44 251 41 44, fax: +41 44 2513476. The location is the draw in this somewhat run-down hotel. Situated in the old town near the station and by the charming Niederdorfstrasse, where there are tons of bars and restaurants. The shower has a timer. Be sure to get all the coins for the shower you need by Saturday, as the reception desk closes on Sundays. Fr. 102 for a double room. Hotel Neufeld, Friesenbergstrasse 15, ☎ +41 43 960 7373, fax: +41 43 960 7374. The comfortable, modern 3-star owner-run hotel is located just a few minutes away from the city centre. All 40 new renovated rooms are comfortable and modern furnished. Perfect for businespeople and tourists. The rates start from Fr. 110 for a single and Fr. 155 for a double room, including tax breakfast and free wifi. Hotel St. Georges, Weberstrasse 11, ☎ +41 44 241 11 44, fax: +41 241 11 42, e-mail: st-georges@bluewin.ch. Traditional and charming owner run hotel in the city centre, 10 minutes walking distance to the train station. Convenient for businespeople as well as tourists and backpackers. The rates start from Fr. 99 for a single and Fr. 228 for a double room, including tax, breakfast and free Wifi. Hotel Adler, Rosengasse 10, ☎ +41 44 266 9696, fax: +41 44 266 96 69, e-mail: info@hotel-adler.ch. Clean rooms and breakfast is included in the price. They have a terrific restaurant attached and associated with the hotel that has delicious fondue. The hotel is in a great area for foot exploration. With many bars, restaurants, and cafes all within a few minutes. They have a single computer on the second floor with free internet access. Fr. 110-230 single room; Fr. 180-310 double. Ambassador à l'Opéra, Falkenstrasse 6, CH-8008, ☎ +41 44 258 9898, fax: +41 44 258 9800, e-mail: welcome@ambassadorhotel.ch. Four-star boutique hotel situated in the town centre, opposite the Opera House and only 10 min away from the main station Hauptbahnhof and 30 minutes from the Zurich airport. Renovated and exquisitely decorated. Single room from Fr. 220, two-person room from Fr. 390 in the low season. Helmhaus, Schifflände 30, ☎ +41 44 266 9595, fax: +41 44 266 9566, e-mail: hotel@helmhaus.ch. Three tram stops with tram number 4 from the main station. Located directly next to the Limmat in the old town of Zurich. Very traditional four star hotel with first-class service, style and modern comfort. Single room from Fr. 230, double room from Fr. 300. Sorell Hotel Rex, Weinbergstrasse 92, ☎ +41 44 360 2525, fax: +41 44 251 2476, e-mail: rex@sorellhotels.ch. Three-star hotel, 5 minutes by tram number 7 from the Hauptbahnhof. All rooms are non-smoking. Single room from Fr. 140, twin room from Fr. 190. Wellenberg, Niederdorfstrasse 10, ☎ +41 43 888 4444, fax: +41 43 888 44 45, e-mail: reservation@hotel-wellenberg.ch. The four-star Art Deco Hotel Wellenberg with its idyllic inner court terrace is in the car-free old town of Zurich, 10 walking minutes from the Hauptbahnhof. The rooms are modern and elegant. One-person room from Fr. 290, two-person room from Fr. 370. Palais Kraft, Kraftstrasse 33, ☎ +41 44 388 8485, fax: +41 44 388 84 86, e-mail: welcome@palaiskraft.com. Three luxury rooms in Zurich's most prestigious residential building. Located 2km from the centre, above the university district at Toblerplatz (Trams 5 and 6, direction Zoo), in the heart of Zurich's prime residential area. The rooms come with a large well-stocked fridge, kitchenette, 32" or bigger flat screen TV, wireless internet access, and open to the terrace of the Palais Kraft. Beginning at Fr. 385 per room/night, including continental breakfast, soft drinks, snacks, internet, local calls, and all taxes. Fr. 330 double-bed guest room with bath and kitchenette. Designer Hotel Greulich, Herman-Greulich-Strasse 56, ☎ +41 43-243 4243, fax: +41 43-243 4200, e-mail: info@greulich.ch. Located in the heart of Zurich's vibrant Aussersihl district, the stunning Hotel Greulich is a haven of style and comfort with a renowned gourmet restaurant. Online booking. Hotel St. Gotthard Zürich, Bahnhofstrasse 87, ☎ +41 44 227 7700, e-mail: reservation@hotelstgotthard.ch. Business hotel. A five-floor building, with 143 spacious rooms, 11 of which aresSuites, comfortable lobby and three restaurants, the Hotel Gotthard meets all the expectations of the demanding traveller. The Hotel Gotthard lies center of the city, located on the Bahnhofstrasse, within 10 minutes walk from sightseeing, the business district and Lake Zurich. Crowne Plaza Zürich, Badenerstrasse 420, ☎ +41 44 404 4444, e-mail: info@cpzurich.ch. Clean rooms and breakfast included in most of the rates. It has a fitness centre, a bar and a restaurant. It is about 200 m away from Albisreiden Tram station (tram number 3). €150-300 per night depending on the room type and the season. Dorint Airport-Hotel Zürich, Riethofstrasse 40, 8152 Opfikon-Glattbrugg, ☎ +41 448081000, e-mail: info.zuerich@dorint.com. The hotel (opened in 2014) is located near the airport and offers 235 rooms. from 160 CHF per room/night. Hotel Widder, Rennweg 7, ☎ +41 44 224 25 26. Known for excellent service and location in the old town, 1-2 min from Bahnhofstrasse. From Fr. 600 single room to Fr. 1500 for 1-bedroom suite. Movenpick Zurich Airport Hotel, ☎ +41 44 808 88 88. Glattbrugg. 5-star hotel minutes from Zurich Airport offering accommodation, 3 restaurants, meeting & conference facilities and a gym. Hotel zum Storchen, Am Weinplatz 2, ☎ +41 44 227 27 27. On the river Limmat with an exclusive restaurant. Baur au lac, Talstrasse 1, ☎ +41 44 220 50 20. Located at the lake, excellent restaurant, popular with actors, celebrities, and politicians. Savoy Baur en Ville, Paradeplatz, ☎ +41 44 215 25 25, fax: +41 44 215 25 00, e-mail: welcome@savoy-zuerich.ch. Rooms are clean and modern but small. Park Hyatt Zurich, Beethovenstrasse 21, ☎ +41 43 883 1234, e-mail: zurich.park@hyattintl.com. expensive but has a very nice room and spa there is a casino too Fr. 2000. Dolder Grand, ☎ +41 44 456 60 00. Kurhausstrasse 65, flagship hotel of Zurich with amazing view and excellent spa. ALDEN Hotel Splügenschloss, Splügenstr. 2, ☎ +41 44 289 9999. A small and intimate five-star boutique hotel in Zürich, located on a quiet side street, near the lakeshore and Bahnhofstrasse. The hotel comprises of two restored landmark buildings and has a modern interior. Zurich Marriott Hotel, Neumühlequai 42 (5 walking minutes from Zurich HB (Main Train Station)), ☎ +41 44 360 7070, e-mail: marriott.zurich@marriotthotels.com. International business hotel with spacious guest rooms, popular restaurants, meeting facilities and a fitness center. Fischer's Fritz Camping, Seestrasse 559, ☎ +41 44 482 16 12, e-mail: camping@fischers-fritz.ch. This camp site is the closest to the city. Many guests were not too happy with the facilities and the friendliness of the owners. University of Zürich was founded in 1833 and has over 24,000 students. It is an excellent university and great place to study. We have a comprehensive list of accommodation in Zürich searchable right here on Travellerspoint. You can use our map to quickly compare budget, mid-range or top of the range accommodation in Zürich and areas nearby. This is version 28. Last edited at 14:30 on Feb 27, 19 by Utrecht. 155 articles link to this page.